We will also take questions via #reprap IRC channel. We are starting an experiment. For a while now, several of us have been thinking of a way to positively and constructively reinforce the unbelievable talent in the #reprap community, focus thinking, structure projects, and landscape a general framework in which progress can be made. 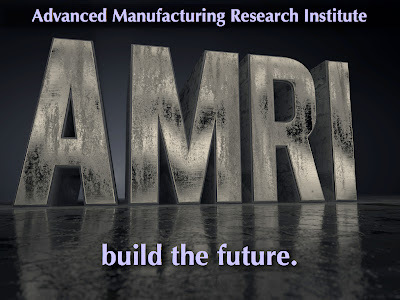 So today I'm pleased to announce the launch of AMRI: Advanced Manufacturing Research Institute. Inspired by Google Summer of Code and work going on at Blender Foundation, AMRI seeks a return to some of the ideals behind the RepRap Research Foundation. The goal is to provide breakthrough mentorship, infrastructure, and research funding for promising young makers to pursue their interests using the scientific method. The end goal is unreservedly profit, if by "profit" you mean: gaining knowledge. Financial gains can be important, though they are secondary considerations at AMRI. Here, we are taking a concerted effort to apply the scientific method to challenges in advanced manufacturing. Andreas Bastian - "3D Printing via laser-sintering of thermoplastic powders"
Steve Kelly - "Ink-jet printing of genetically modified living bacteria"
Anderson Ta - "Digital light projection (DLP) photolithography of plastics and hydrogels"
Ravi Sheth - "Bacterial cellstruder for synthetic biology studies"
This year, AMRI runs from August 1st-August 31st. We have already started. This fellowship program is is an experiment. A soft-launch. We have some makers that were personally invited to take part in our experiment, sketch out research projects critical to Science, and make progress. Cool, so who's paying for this? We have secured sponsorship so far from Rice University, Maryland Institute College of Art (MICA), Ultimachine, Ultimaker, MakerGear, and SeeMeCNC. Thank you all! We are open to additional sponsorship... Contact us! We are taking tax-deductible donations of any amount through Rice University's 501(c)3 here. The charge to your account will read "RICE-IT WEB SRVC"
Donations will be used to help support the current projects, and any excess funds then organized to launch AMRI publicly and openly for Summer 2014 projects. We are currently running AMRI strictly through donations. New open source slicer: CuraEngine! "Cura is the name of a divine figure whose name means "Care" or "Concern""
Ever heard of Cura? Besides a divine figure, it's a 3D printing solution that is meant to be useful and usable to both beginning and advanced 3D printer users. David Braam is full-time developer of Cura, at Ultimaker. We recently released version 13.06, which was a major update. Compared to the previous version it looked... well ...exactly the same. But on the back-end, the engine that generates the toolpath from the mesh-surface model (e.g. the STL or AMF) was replaced by a new engine, written entirely from scratch. What took hours now takes seconds. Also, this enabled us to create the following two features. There is no slicing button anymore because it starts processing right-away. Because you see toolpaths re-appear whenever you change a setting, you can quicky find the optimal settings for your print job. The engine can fix major problem in a model. The engine was built from the start with multi-head printing in mind. The Engine is written in C++ and released for Linux, Windows & Mac. Compilation on these and other platform should be trivial. The license is Affero GPLv3. The main goals for this new engine were to be able to implement innovative features that improve the quality of 3D printed objects, and to create a code structure that encourages further development. An intermediate goal was to release it with the baseline feature set that is common in slicing engines, including the ability to robustly handle many kinds of (problematic) models and generate support structures. A nice side effect of the new slicer is that it turns out to be fast, really fast. We decided to do something unconventional: removing the "Prepare for printing" button from Cura's interface entirely. It will just start slice the model in the background (with a low-priority). If you change the layer height or any other setting, it will just restart. If you don't change settings, it may already have finished before you're thinking to save the resulting G-Code to an SD card or print directly through USB. An extra, pretty useful, side-effect is that you can inspect the generated toolpath, change the settings and see the new toolpath preview appear automatically and quickly, without pushing a button. Because Cura is developed to work with the Ultimaker and most other RepRap-based designs, we'd like to ask you what you think of the new engine. Also, because, like Cura (source), the Engine is released under the Affero GPL version 3, we'd love to see anyone benefit from this new solution and possibly help us improve it further. Below is a 45-minute presentation on the Cura release, focusing mostly on the new Cura Engine.